I new scenario, North America without the rocky mountains running through the west. I'm thinking the oceanic climate belt would Montana and Eastern Alberta in Canada slowly grading off into a Humid continental climate further west. The inflow of Oceanic air from the pacific may stop those great storms and tornadoes the Great plains endure (and heat) during the summer. Winters will be milder across the board, especially in the west (just east of the rocky mountains) but wetter in the winter. The desert southwest wouldn't have a rain shadow - rocky mountains to protect it from pacific storms so I'm guessing it would no longer be the desert southwest maybe the grassy southwest instead. In another thread it was mentioned that the mountain range makes the jet stream ''buckle'' causing it to dive down into the Eastern quarter of the United states, pulling down arctic air-masses from North Canada, so possibly record lows in the east would be more moderate and temperatures more stable in the winter. Nonsense. There would still be plenty of cold. Look at the Ukraine. Lots of cold there, and they don't have the "Rockies" blocking all the warmth. Things would be wetter on the western "prairies" though. Ukraine is still warmer than North America at a similar latitude. Further east into Russia has among the hottest summers in the world for its latitude. Are the Cascades and Sierra Nevada still around? As well as the Sierra Madre in Mexico? They block most rain from the Pacific before it can get to the Rockies, the effect is huge in Washington and Oregon. Eastern Washington, Oregon, Idaho, Nevada, and the like would probably still be quite dry since the moisture from the Gulf of Mexico and Atlantic diminishes from east to west. Yes, the Rockies don't do much precipitation blocking. It's mostly the Sierra / Cascade chain, and in BC, the Coast Range. considered to be the Rockies. A common misconception, only the eastern most range is. Only if you remove the entire western mountain system (Western Cordillera), then most of what the OP stated makes sense. However, if the Sierra Nevada, Cascades and BC Coast Mtns remain in place then there is IMO not really that much change to the climate of western North America. 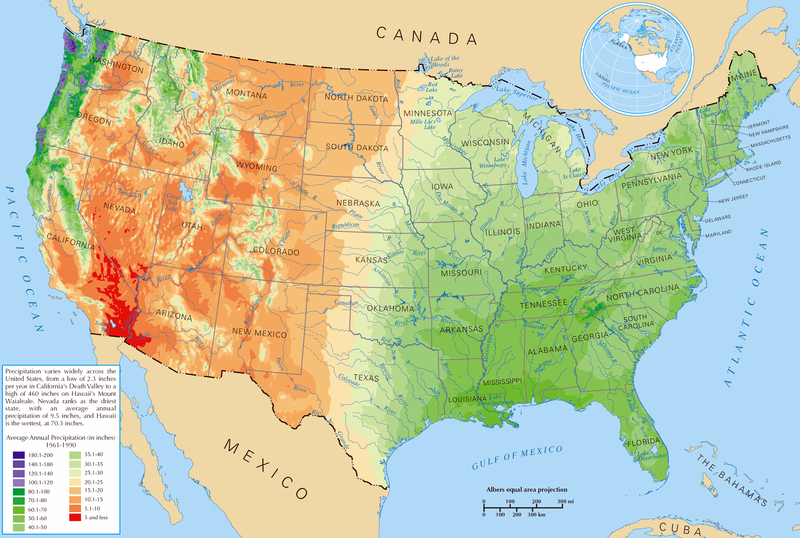 Also in any scenario SW USA would probably still be mostly arid desert as it is located in that 30-35 degrees from equator zone of the world that tends to be desert, due mainly to other factors than just being in a rainshadow of high mountains. Though desert-like conditions in NA extending north from about 36N to 51N is strongly influenced by mountain rainshadow effect.